Time to get off the fence and register for the Crab Claw (September 24-25). Early registration ends today so don’t delay! Go to the severnsailing.org and find the regatta in the Racing and Event Calendar, or use this following link to access the registration page directly. An awesome regatta hat (guaranteed for the first 36 sailors), breakfast ticket, and regatta dinner and beverages after racing on Saturday. Additional dinner tickets may be purchased on-line or at on-site registration, for $30 each (children 10 and under eat for $6). If steamed crabs are not your thing, we will have the following menu items from Crab Town Curbs. See the NOR for all other details and feel free to email with any questions. I hope to see you there! 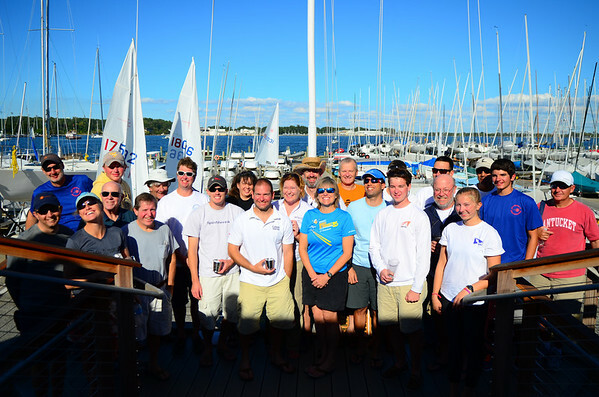 The Crab Claw Regatta, the Laser Fleet’s last regatta of the year, was a prime example of the mercurial ways of the Chesapeake Bay weather systems. Turnout was lighter than usual due to a pretty dismal weather forecast. We were looking at a modest 4 knot forecast on Saturday and a positively dismal 0-1 knot forecast for Sunday. I was pleased to see the 19 boats that showed up over the two days in spite of the outlook. The Race Committee, led by PRO Juliet Thompson, did a great job over the two days in very difficult conditions. Saturday started out with a light easterly breeze enabling the RC to get one race off before the breeze died. We floated around in the motorboat chop off Bembe Beach for a couple of hours waiting for breeze. By two o’clock it had filled in, veering around to the southeast; the RC was right on top of it and put together two decent races before calling it a day. The crabs and cold beer were waiting at the dock. Sailors enjoyed the dinner, drinks and camaraderie until it was time to crawl off to bed. 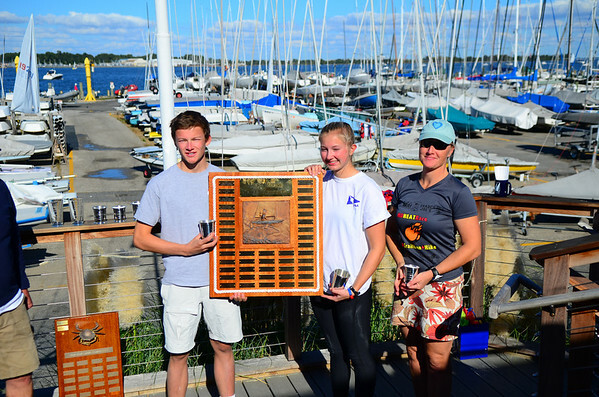 There was some talk of a repeat of last week’s one-day regatta as the forecast for Sunday remained unpromising, 0-1 with a 180 degree shift in the middle of the day. Sunday saw a reduced fleet (5 Radials and 9 Standard rigs) due to the forecast. Although the sun was shining without a cloud in the sky and the temperature was delightful, the flags were hanging limply from the yardarm. The RC wisely counseled postponing ashore and we agreed to give it until eleven or twelve o’clock before throwing in the towel. Jonathon Phillips and Bill Lawson jumped in their Lasers anyway and went out to see if the slight harbor breeze would improve further out. Luke and Steve launched their kayaks for a change of pace. By about ten thirty a fairly consistent wind line could be seen spreading across the bay. That was enough to scramble the RC, get boats rigged and see a parade of Lasers set out to the course. 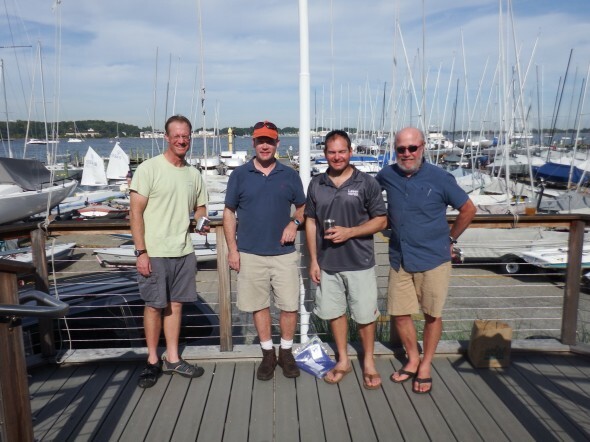 The RC managed to get in four decent races in 6-8 knots before two o’clock. In the Standard fleet it was Jon Deutsch adding one more bullet to the three bullets from Saturday with a six race total score of 10, followed by Luke Shingledecker with 15 and Jonathon Phillips (with a bullet in the last race) close behind at 18. The Radial fleet saw an outstanding effort by Phillip Schofield and Dorian Haldeman who were dead-even at 9 points over six races. 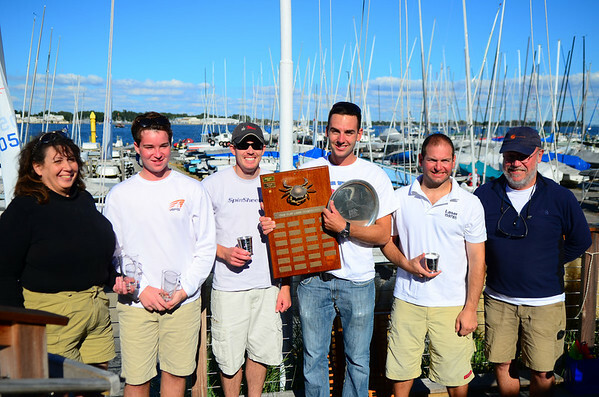 Each sailor had three bullets and three second place finishes. The tie breaker came down to the throw-out race with Phillip’s 3 trumping Dorian’s 4. In third place was Adam Wolnikowski from the Susquehanna Yacht Club. Annapolis Performance Sailing graciously sponsored the regatta, providing a number of gift certificates for the lucky sailors that remained and Sandy Westphal provided some very cool and useful sail bags as door prizes. 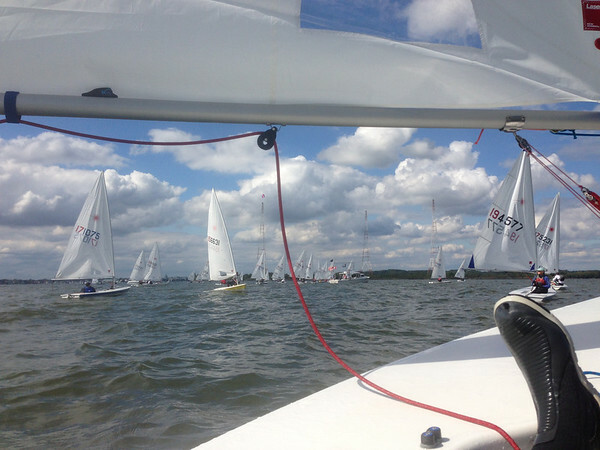 Severn Sailing Association is hosting the Annual Crab Claw Regatta on the 27th and 28th of September this year. 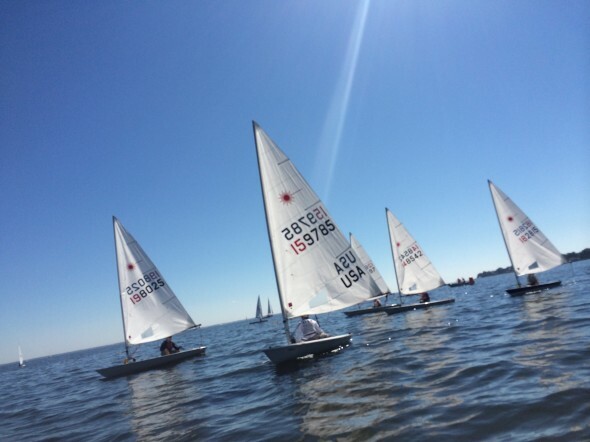 This event is a great opportunity to visit the beautiful town of Annapolis in the fall, eat Chesapeake Bay Blue Crab and race Lasers with competitors from up and down the east coast. Early registration will guarantee a regatta hat and save you money to boot. 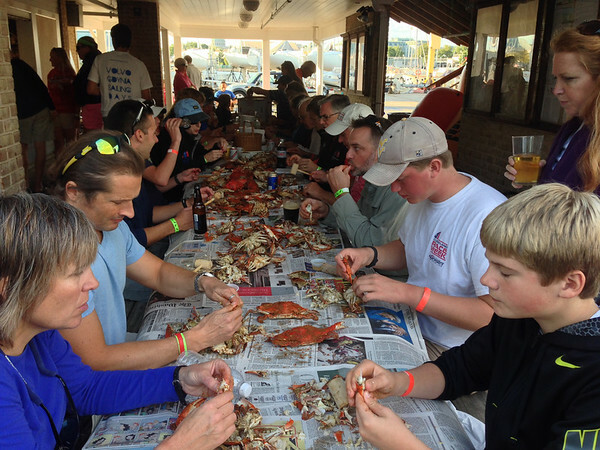 Two days of racing are planned along with crabs, drinks and dinner on the upper deck after racing on Saturday. Visit the event page for the NOR and all the information on how to register.